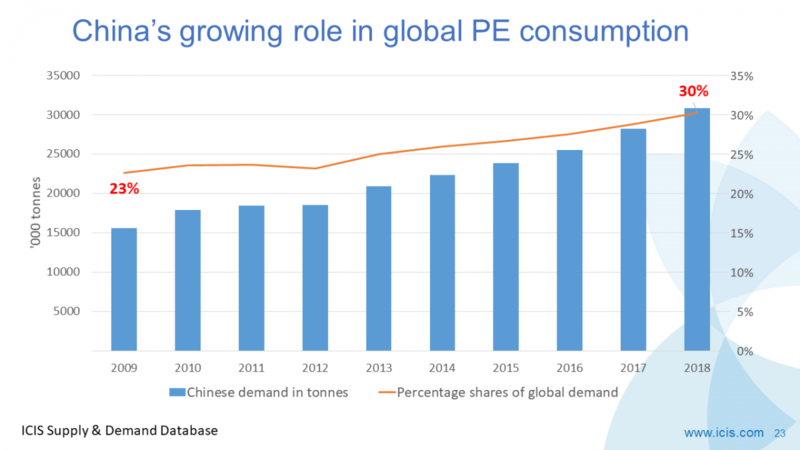 THE above chart may end up being an underestimate of the extent to which US linear-low density polyethylene (LLDPE) gains further market share in Europe. 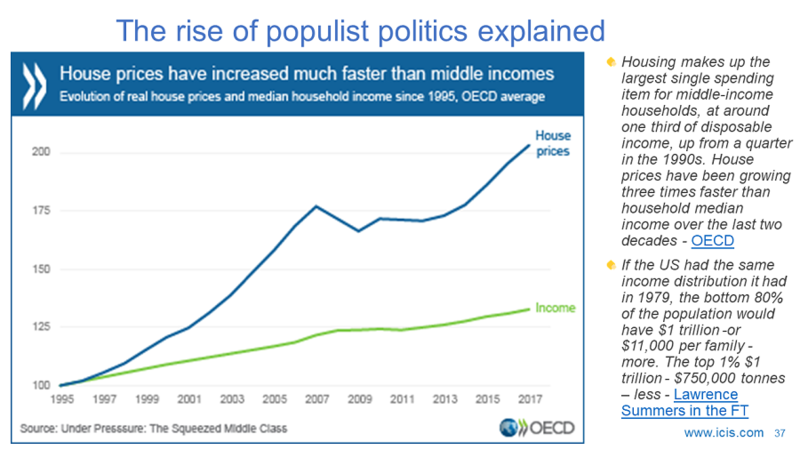 But this chart is by itself bad enough. In 2018 compared with 2017, US shipments to Europe rose to around 727,000 tonnes from 250,000 tonnes. As you can see from the chart, this led to a rise in US imports as a total of European imports to 42% from 14% the year before. Meanwhile, European shipments as a percentage of total US exports increased to 21% from 11%. I estimate that total US LLDPE exports will jump to 4.5m tonnes in 2019 versus last year’s 3.4m tonnes. This is based on a rising surplus of local production over domestic demand. European imports will creep up to around 1.8m tonnes from 1.7m tonnes in 2017. This is based on our forecasts of the gap between increases in local demand versus local production. 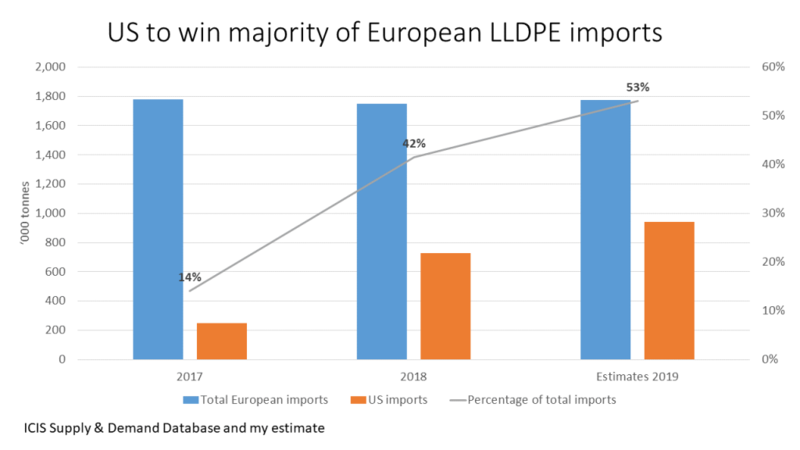 If the US were to again export 21% of its total exports to Europe in 2019, Europe would end up receiving 942,000 tonnes of US LLDPE – 53% of the European total. Even in the event of these perhaps conservative forecasts being right, this would still result in the market share of other exporters to Europe, such as the Middle East, being further eroded. Our trade data from the region is as at the moment too dated to draw any valid statistical conclusions for 2018. But it seems certain that the region must have lost market share to the US. Let’s assume that European economy slows more than we expect and that European LLDPE imports instead of increasing actually fall. The scale of my assumed shipments are enough to cause major problems, forcing European cracker and derivatives operators to lower their operating rates. Perhaps capacity utilisation will still have to be cut, even if the European economy does fine? Lower production would reduce the availability of the co-products from liquids cracking – propylene, C4 olefins and aromatics. Shortages would have a negative effect on downstream industries and thus the broader European economy. If the situation is merely as bad as I predict, might European producers apply for protective tariffs? Complicating this is that several LLDPE producers have feet in both camps – i.e. they have new US LLDPE capacities they need to sell and much older European plants. “So be it, we’ll shut our European plants down,’ might be the ultimate decision, further down the line, by some of the producers with feet in both camps. But those that are European only LLDPE producers may successfully push legislators for protection. Now let’s discuss why the US may end up exporting more than 942,000 tonnes of LLDPE to Europe. What if the US/China trade war continues? Here is my summary of the fluctuating likelihood of a deal, and this only since January this year: Yes, no, maybe, yes, no, yes, and perhaps yes but with some very tough new US conditions. The “perhaps yes but with some very tough new US conditions” latest twist in the tale emerged last week as a result of comments made by Robert Lighthizer, US trade representative. US trade negotiators announced yesterday that they will fly to Beijing next week to try and seal a deal. The curve ball thrown by Robert Lighthizer suggests that existing US tariffs might stay in place as a means of making China comply with the deal. If this were to be an agreed condition, then wouldn’t China want to keep its own tariffs in place, including the 25% duties on 93% of the grades of US LLDPE shipped to China? Let’s assume China keeps its duties in place. The above chart shows what could happen. 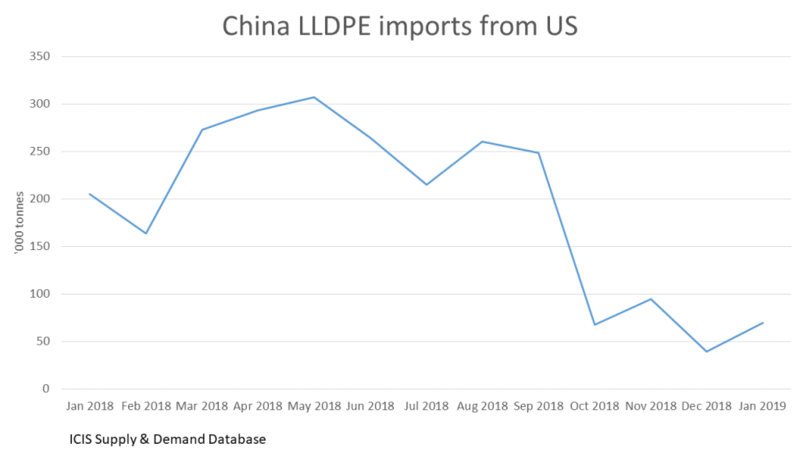 As you can see, China’s imports of US LLDPE fell off a cliff after the tariffs were imposed in late August. There was a rebound in January this year, but imports remained well below their pre-August level. Might the steep fall in US shipments to China between September and December of last year reflect on overall dip in Chinese imports? No. In September-December, total Chinese imports were only 0.7% lower than in the four months from May until August. 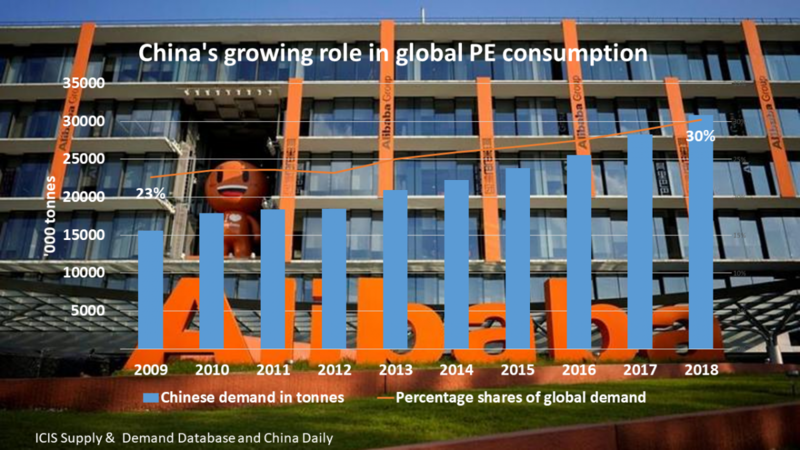 Further, China’s LLDPE imports surged by 28% in January this year compared with the same month in 2018. Most of this extra volume was delivered by Indian producers, with the US gaining just a 1.4% share of total Chinese imports. 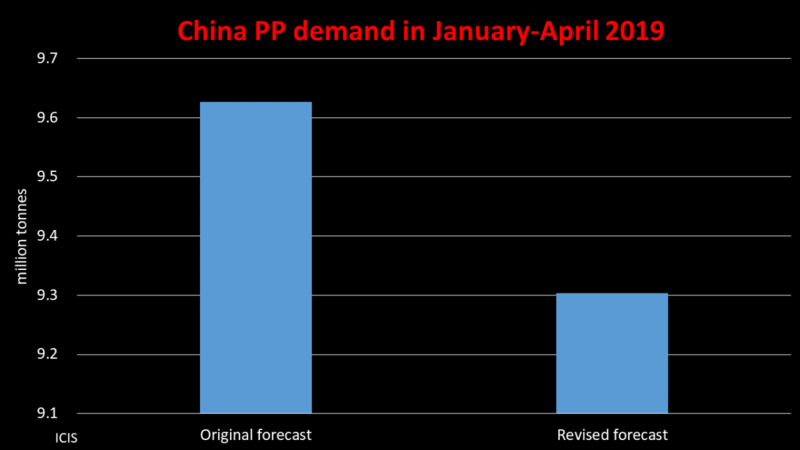 One month of Chinese import data is of course far too slim to draw any firm conclusions. But if this trend were to continue then the US would have no choice but to flood the world’s second-biggest import market behind China, which is Europe, with even more material than I have forecast. Or the US might decide to bite the financial bullet and absorb all of the 25% duties. Either that or persuade Chinese customers to share the burden. This should at least enable the US to restore shipments to China to their pre-August levels. 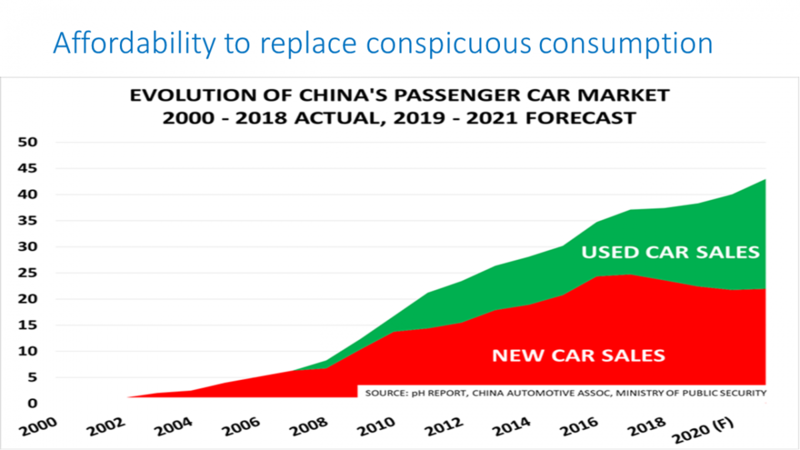 But the statistical reality remains that the US needs to gain more market share in China. Then though would come the issue of netbacks. Including the 25% tariffs, or at least a part of them, could make Europe a lot more attractive an option. 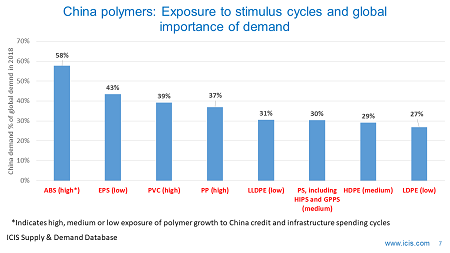 So again, Europe might end up receiving more US LLDPE than I have predicted in my chart because it’s more profitable? We had expected Turkish LLDPE demand to grow by 3.1% in 2018 over the previous year. We had then expected a 6.9% rise this year. But this is not going to happen because of Turkey’s economic problems. Growth last year looked as if it slipped by 2.9%. Let’s assume, for argument’s sake, the same thing happens this year. 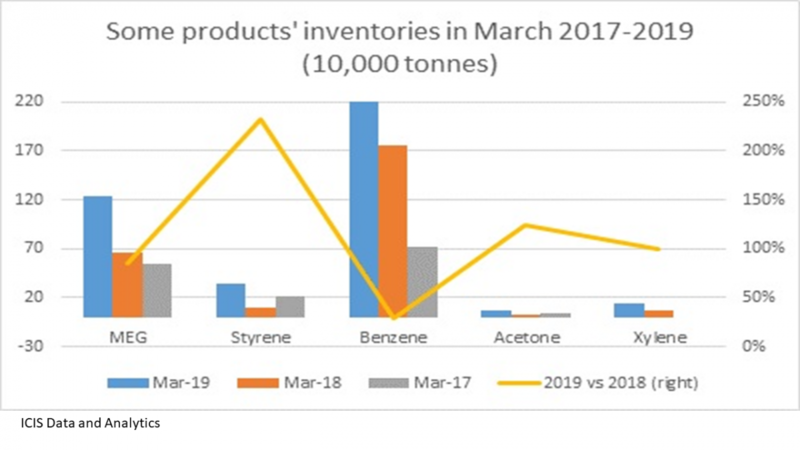 The end- result is a loss of 125,000 tonnes of demand in 2018-2019 versus our base case. Last year, the US made big gains in the Turkish LLDPE markets. US shipments rose to 133,787 tonnes from just 16,256 tonnes in 2017. No other importer saw a major decline in market share during 2018, however, despite the fall in Turkish demand. The reason was a sharp drop in Iranian imports because of new renewed sanctions. But this year could be different. If other exporters, including European exporters, successfully fight for market share in an even smaller Turkish market, the US may again have to divert more cargoes to Europe. The alternative is that the US maintains or raises its exports to Turkey and in so doing exerts more pressure on European producers. This could make some European players more likely to seek protection. New US projects LLDPE and other PE projects were sanctioned during a very different economic and geopolitical era, when all the old certainties were still in place. I worried even at that time that the projects would struggle to fit into the global market. 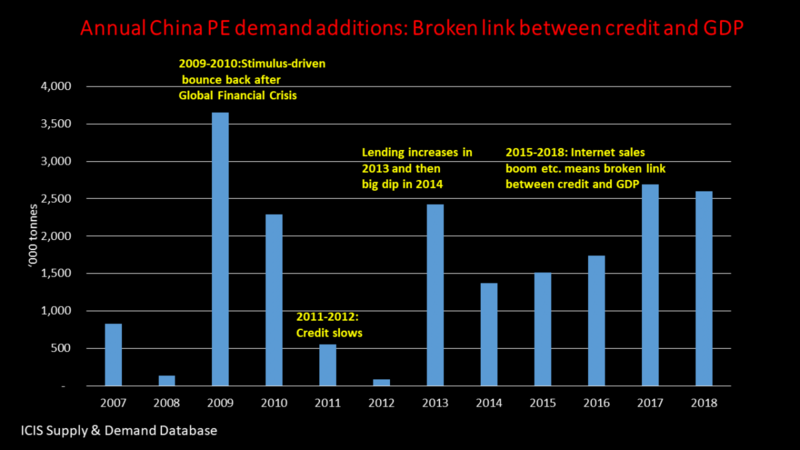 Changed circumstances create a much greater risk that new US volumes will create significant difficulties. Everything may turn out alright in the end. I hope so, but I don’t think so. My advice is to therefore make full use or excellent ICIS analytics and data services to keep a close track of this rapidly evolving situation.